I had to build a fairly complex workflow not long ago. The workflow was built in SharePoint Designer 2013 and had a lot of moving parts to it. So many, that when I went to publish it I received the following error message: “Microsoft.Workflow.Client.ActivityValidationException: Workflow XAML failed validation due to the following errors: Activity “SomeXActivity” has 65 arguments, which exceeds the maximum number of arguments per activity (50).” This error message is actually telling us that our workflow has too many variables within it. Basically, this is happening because when the workflow is running the Workflow Manager has to manage more 58 (in my case) variables. Workflow Manager only allows there to be 50 variables in the workflow… by default. I recently had a need to read data from an xml configuration file that was stored within a SharePoint library. To make things easier I of course went to Google (or Bing) and checked to see if someone else had yet blogged this. Couldn’t find anything, so in order to help out someone else that may need to do the same at some point, I wrote up a quick little blog. Note: this will only work for on-premises versions of SharePoint. I’ll update with a SharePoint Online version in the future. I’ll also write up how to add and delete contents in a future post as well. At no point in the logs did it tell me where this problem was occurring. So where do we go from here? Well let’s dig into it shall we? This is the second part in my series on developing code to modify external lists. 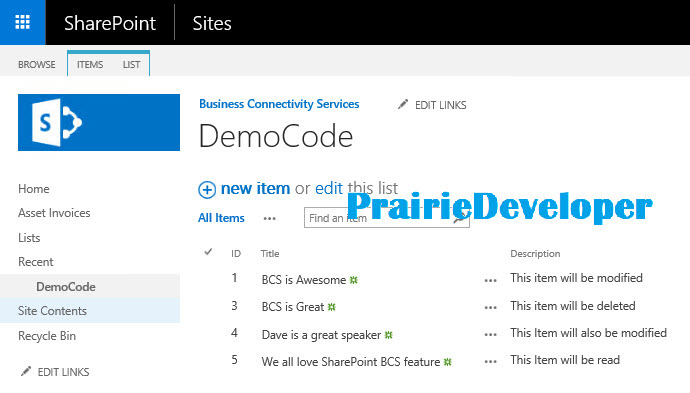 In this post we will be updating SharePoint external lists using CSOM. Like standard PowerShell there is not any real difference in the execution of the update between internal and external lists. What is different is how the data is obtained when performing an update, read or deletion. Like PowerShell, in CSOM you can find the item you wish to access using the ID. However, because there isn’t a list ID field in an external list you have to query to find the item(s) you need. You could loop through each item in the list until you find one with the particular attributes you are looking for, but that is not efficient and it may be difficult if the fields you are checking have multiple rows with the same values. So brush up on your CAML query. 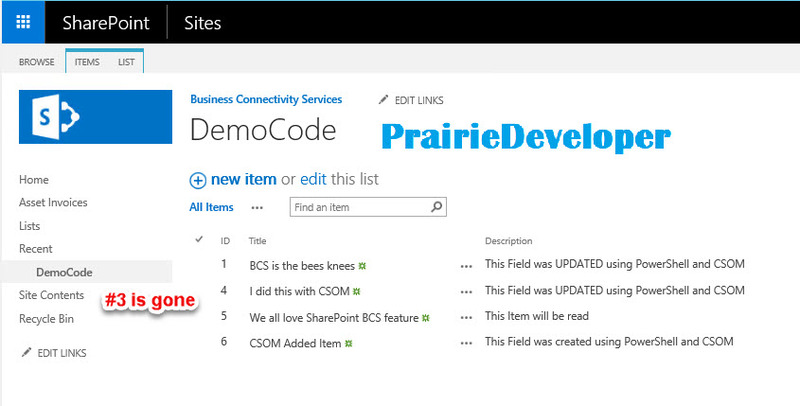 CSOM has come a long way since its inception in SharePoint 2010. I would still be recommending it over REST except that unlike REST things are a bit different between on-prem and SharePoint Online CSOM versions (you need a different versions for each). This post isn’t meant as a discussion on the pros and cons of REST vs CSOM though (You can get more information here if you are curious though). CSOM is probably a little more complicated than the PowerShell examples I provided in my previous post, but one you get the hang of loading the data you need before working with it the process is pretty easy. As I stated above, the code is very similar to internal lists except there you need to use CAML Query to access the items. Note with CSOM you don’t have to define the ServiceContext scope. So again, other than gathering the item to update, managing items in an external list is very similar to managing items in an internal list. My next post we will cover the differences in manipulating internal and external items with REST.